David Renner is a third generation farmer who also has a degree in biological sciences from Oxford University. What particularly interested him during his studies was a module on plants, productivity and the environment and he went on to do an MA in organic farming at Aberdeen SAC SRUC. This developed his interest in the soil and resulted in him encouraging his father to go organic in 2002. As part of his MA, David Renner completed a project on intercropping with vetch and spring barley and he rang the founder of Cotswold Seeds, the late Robin Hill, for advice. ‘He went out of his way to help me,’ David remembers and he was so impressed with Robin’s knowledge that Cotswold Seeds were the first port of call when David was looking round for a grazing mixture; three hundred and eighty ewes are calved on the farm, and there’s a herd of 42 suckler cows. The ley was to be put into a long seven year rotation, with the five year grass ley, followed by winter oats, spring barley and then back to grass. 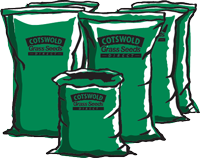 Cotswold Seeds recommend a Lamins humus builder mix with added vetch. Because of the relatively short time between sowing and silaging, it’s necessary to have a crop that bulks up quickly. It also needs to include forge herbs, particularly plantain and chicory, which is good for sheep health, has anthelmintic properties and is high in protein. The strong rooting, Lamins also suits the location of the farm, which at 125m above sea level, is relatively high for mid Northumberland, and the clayey soil can be fairly heavy to work. The ground is ploughed and power-harrowed before sowing in May and silaging in autumn. The first year silage is given to cattle over winter, with succeeding years given to sheep. After silaging the aftermath is used for grazing weaned lambs, which do very well on it. One of the things David was taught at Aberdeen was how plants that are deep rooted, like chicory, will bring trace elements up through the soil profile and make them available to the animals that eat these plants. This is particularly important in Northumberland where soils are naturally deficient in copper, cobalt and selenium. ‘We’ve not noticed any particular trace element deficiencies in our animals, so it’s clearly doing them good,’ says David. The component of forage herbs is also beneficial. ‘Chicory is good for worm control and the sheep and cattle love the plantain. Burnet and sheep’s parsley do die out after the first few years, but the sheep and cattle like eating them. The results have been so good that this mix has been used on the farm ever since. Twenty hectares are sown per year now, so there are 100 hectares of the ley on the farm at any given time. ‘I am very happy with it,’ says David.